Sinus rhythm at a rate of 60, with a normal PR interval, and right bundle branch block with no ischemia. There are inferior Q-waves diagnostic of old inferior MI. 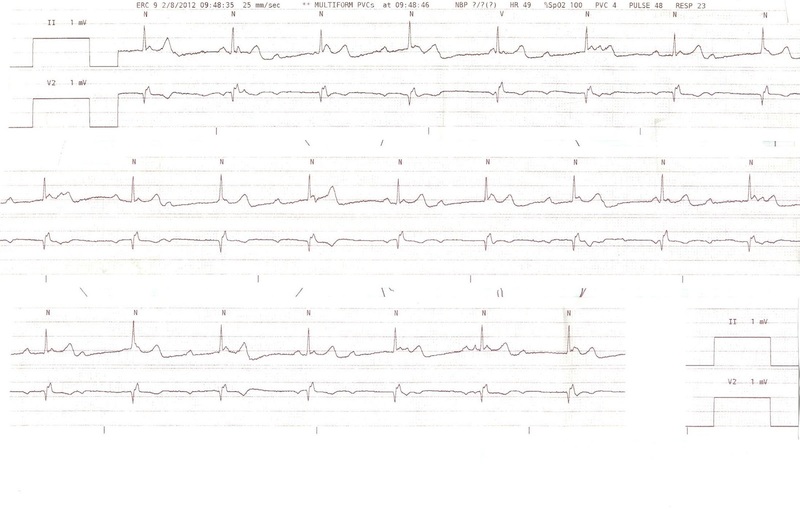 The upright T-waves in V1-V3 are slightly unusual for RBBB, but nondiagnostic. It is not known whether RBBB is new or old. There is 3rd degree AV block at a rate of 43 (again), still with RBBB but now with an obvious inferior STEMI. There is also some ischemic ST depression in V5 and V6. The sinus node has a rate of about 75, so there is no excess vagal tone, and therefore no utility of atropine. One might think that because there is associated RBBB, that it is infranodal AV block. But the RBBB was present when the block and ST elevation were not, so it is likely a baseline feature of this patient's ECG. Furthermore, inferior STEMI is much less likely to cause infranodal block. The blood supply to the AV node is from the RCA, and the infranodal (HIS bundle) area is supplied by the LAD. Therefore, intranodal (in the AV node) block is much more likely than infranodal (below the AV node, in the bundle of HIS). When in the node, AV block has a much better prognosis than when below the node. Persistent here is important, because it is likely that, after opening the artery, the block will resolve, and thus will not be persistent. The patient was comfortable while supine, even with 3rd degree AV block. The block was intranodal. The patient would soon have PCI. So no pacing was necessary. One should have external (transcutaneous) pacing at the ready in case of worsening block, but with inferior STEMI this is unlikely to be necessary. Sinus rhythm without any AV block. ST elevation is resolved and there is inferior T-wave inversion (reperfusion T-waves). 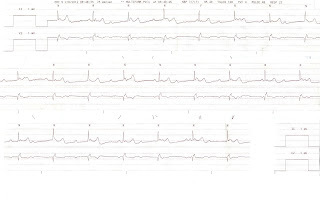 RBBB is persistent, the T-waves and ST segments are more normal for RBBB. Is this normalization after resolution of ischemia? Or is this T-wave inversion due to reperfused posterior MI? Without a previous ECG, it is hard to know for sure. Initial troponin I was 0.035 ng/ml (99% reference, 0.034) and peaked at 13.4. Echo showed infero-postero-lateral wall motion abnormality. 1. STEMI does not always have chest pain or SOB. It is wise to obtain serial ECGs when there are ischemic symptoms, and especially with AV block. 3. Infranodal AV block, especially in the context of anterior STEMI, is very dangerous and will probably require internal pacing unless the artery can rapidly be opened. Before the artery is opened, it is at least likely to require external pacing. Dr Smith, in the context of inferior STEMI, I think STE in V1 may be relating to RVMI. What your opinion about this? Right ventricular myocardial infarction (RVMI) comprises 20-30% of inferior ST elevation MI (STEMI). It is an important entity to recognize as RVMI is associated with significant short term morbidity and mortality. RVMI diagnosis has conventionally required obtaining a right sided ECG. Our objective is to evaluate, in the presence of inferior myocardial infarction (MI), the sensitivity and specificity the standard 12-lead electrocardiogram (ECG) for right ventricular MI (RVMI). We retrospectively studied a cohort of consecutive inferior STEMI, comparing the ECGs of patients with, to those without, RVMI, as determined by angiographic coronary occlusion proximal to the RV marginal branch. ST segments were measured in leads I, II, III, aVF, V1, and V2. The primary outcome was sensitivity and specificity of 1) ST depression (STD) in lead I and 2) ST Elevation (STE) in lead V1, stratified by presence or absence of posterior MI, as determined by STD in lead V2, for differentiating RVMI from non-RVMI. Of 149 patients with inferior STEMI, 43 (29%) had RVMI and 106 (71%) did not. There was no difference in STD in Lead I between patients with (37/43, 86%) and without RVMI (85/106, 80%, p=0.56). Of patients with RVMI, (15/43, 35%) had STE in V1, versus (17/106, 16%) without RVMI (p = 0.015). Specificity of STE in lead V1 for RVMI was 84% and sensitivity was 35%. Sensitivity of STE in V1 was higher with STD in V2 (69%) than without (15%) (p < 0.001). Among inferior STEMI, the presence of ST depression in lead I is not specific for differentiating RVMI from non-RVMI. ST elevation in lead V1 is specific, and when there is no concomitant STD in V2, it is moderately sensitive for RVMI. Diagnostic characteristics of the standard 12-lead ECG are inadequate to reliably diagnose RVMI.